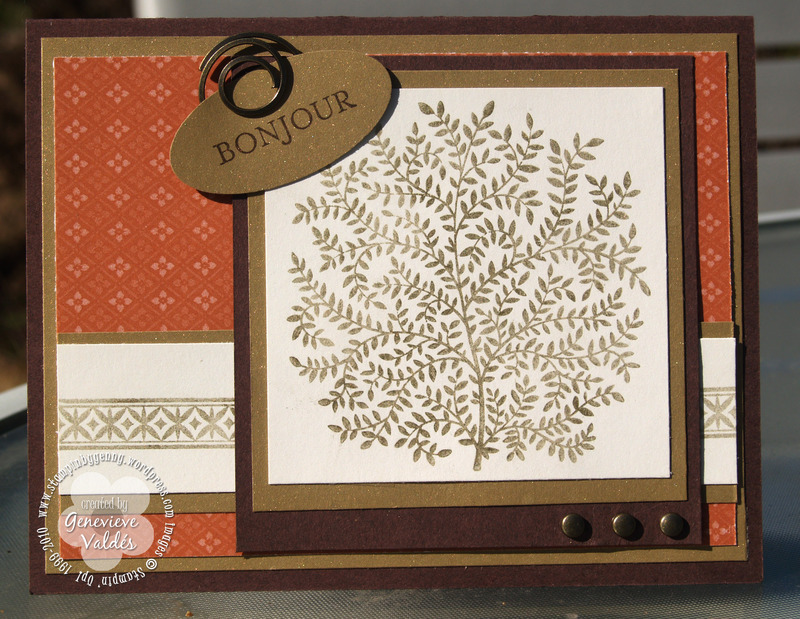 I have been meaning to make a card with the stamp set French version of Pendant Park. It has a beautiful tree and border that I love. So for this week’s PPA sketch challenge I decided to use these two stamps and the sentiment from the French Pendant Park set. I combined Chocolate Chip, Very Vanilla and Brushed Gold card stock with Really Rust DSP from the Hostess level 1 pack. I added the metallic swirl and vintage brads to accent the metallic paper. For another metallic touch I stamped the tree and the border with gold Encore ink and heat set it. To help me stamp the border straight and extend it I used my Stamp-A-Ma-Jig. I enjoyed playing along with this challenge. For more inspiration go to PPA and see all the beautiful cards created by the designers. All Stampin’ Up! items below may be ordered from my website. Beautiful layout. Thanks for posting your blog on Stampin’ Connection!